Dr. Jillani is a Child and Adolescent Psychiatry Fellow, Yale Child Study Center, Yale University, New Haven, CT. Dr. Patel is a Pediatric Resident Physician, Winthrop University Hospital, Mineola, NY. Dr. Trestman is Professor of Medicine, Psychiatry, and Nursing, University of Connecticut School of Medicine, and Executive Director, UConn Health Correctional Managed Health Care, Farmington, CT. Dr. Kamath is Associate Professor, Department of Psychiatry, University of Connecticut Health Center, Farmington, CT. Effective interventions for adolescents with attention deficit/hyperactivity disorder (ADHD) in the correctional setting may improve care during incarceration, decrease risk of substance relapse, and reduce recidivism after release from the correctional setting of these individuals. The present report delineates the epidemiology of adolescent ADHD in the correctional setting and its association with substance use disorders and comorbid psychiatric illnesses. Evidence suggests that adolescents with ADHD have a higher risk of arrest and incarceration during adulthood. The present report examines evidence related to efficacy of atomoxetine, a nonstimulant medication for the treatment of adolescent ADHD, and presents data from a case series evaluating the effectiveness of atomoxetine for the treatment of adolescent ADHD in the Connecticut correctional setting. The results from the case series suggest that atomoxetine is effective for the treatment of adolescent ADHD in the context of significant past substance use. In summary, adolescents with ADHD have an elevated risk of incarceration and developing substance use disorders. The present review and pilot case series suggest that atomoxetine is an effective treatment for adolescents with ADHD in the correctional setting. Epidemiological studies of incarcerated adolescents report high prevalence rates (males 16.6%, females 21.4%) of attention-deficit hyperactivity disorder (ADHD).1 Effective interventions for ADHD in the correctional setting may translate into improved behavioral management of these individuals during incarceration and may lead to better social integration, decreased risk of substance misuse, and reincarceration. Childhood ADHD is associated with an earlier age of onset of disruptive behavior and a higher risk of arrest and incarceration during adolescence and early adulthood.2 Prospective follow-up studies of children with ADHD have emphasized the connection between ADHD, conduct problems, substance misuse, and delinquency.3 In the present report, we review evidence related to adolescent ADHD, its association with substance misuse, psychiatric comorbidities, and the potential role of atomoxetine in treating ADHD in this population. We also describe a case series investigation of the effectiveness of atomoxetine in treating adolescent ADHD in a correctional setting. For this nonexhaustive review, articles pertaining to child and adolescent ADHD in the correctional setting were retrieved from several search engines: Psych info, PubMed, Medline, and Google Scholar. Key search words included: (1) ADHD, Adolescents, and Prison; (2) ADHD, Adolescents, and Substance Use Disorders; and (3) Atomoxetine, ADHD, and Substance Use Disorders. Research has revealed a strong association between childhood ADHD and delinquency in adulthood. Children with ADHD are at increased risk for both juvenile and adult criminality.9 A study conducted in a large (n = 2,713) sample of Finnish boys identified hyperactivity as an important predictor of criminality in late adolescence.10 Studies prospectively observing children with and without ADHD into adolescence and adulthood demonstrated significantly higher rates of criminal convictions compared with age-matched control subjects without ADHD.3,11,12 Dalsgaard and colleagues11 documented that children with ADHD are about 5 times more likely to have any conviction and 12 times more likely to be convicted for a violent crime than are peers without ADHD in the general population. The same study demonstrated that girls with ADHD are also at increased risk of criminal convictions compared with age-matched control subjects. 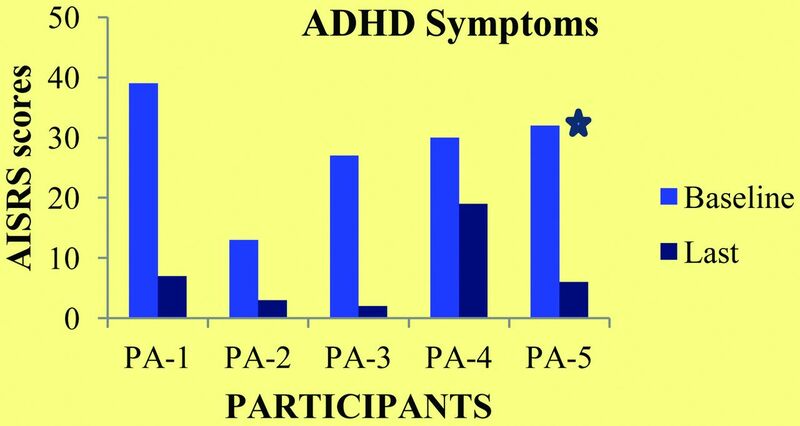 Another class of agents, the α2-adrenoreceptor agonists, have shown efficacy in the treatment of ADHD in children and adolescents. Several studies have demonstrated the efficacy of the immediate-release formulations of the α2 agonists clonidine and guanfacine for the treatment of ADHD in children and adolescents (reviewed in Ref. 29). These agents are not approved by the FDA for the treatment of ADHD, but are frequently used off label for this purpose. Extended-release formulations of clonidine and guanfacine have been approved by the FDA for the treatment of ADHD in children and adolescents. These agents are alternatives to psychostimulants in the correctional setting because of their limited potential for abuse. However, their use is restricted by possible cardiovascular side effects (Table 1).29,30 These cardiovascular side effects include hypotension, bradycardia, and QTc prolongation.29,30 Similar to psychostimulants, cardiovascular side effects with these agents may be especially problematic in the context of pre-existing cardiovascular damage subsequent to illicit substance use (e.g., cocaine). To date, studies have evaluated the effectiveness of α2-agonist agents in the correctional setting. Atomoxetine may offer an important option for the safe and effective treatment of ADHD in incarcerated adolescents, with or without comorbid SUD. To our knowledge, no studies have been conducted to investigate the effectiveness of atomoxetine in the treatment of adolescent ADHD in the correctional setting. An open-label case series was conducted in a youth facility in the Connecticut Department of Correction (CDOC). The purpose of this series was to investigate the effectiveness of atomoxetine for the treatment of adolescent ADHD in the correctional environment. The study protocol and procedures were approved by the Institutional Review Board of the University of Connecticut Health Center and the Research Advisory Committee of the CDOC. We enrolled five inmates in this naturalistic case series. All participants reported significant past substance abuse or dependency. Four inmates completed the study. One inmate withdrew at eight weeks because of persistent headaches. All who completed the study were able to tolerate the target 80-mg/day dosage of atomoxetine. The baseline AISRS scores ranged from 27 to 41. The change in the AISRS scores from baseline to the last follow-up visit showed an 80 to 90 percent improvement in ADHD symptoms (Fig. 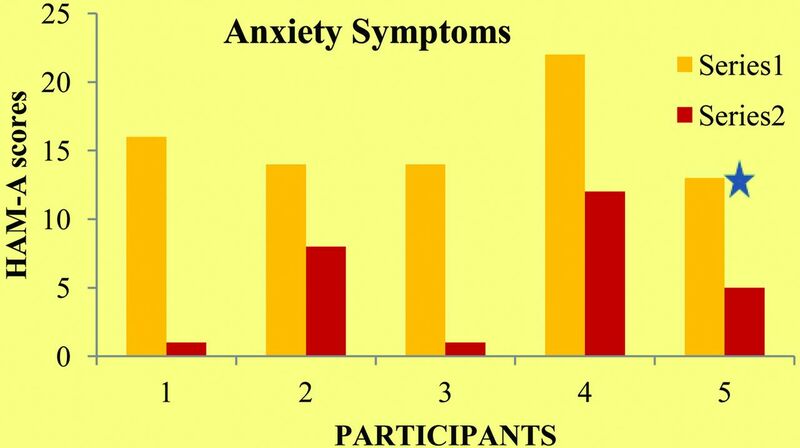 1), and the change in HAM-A scores showed an improvement in anxiety symptoms (Fig. 2). Change in ADHD symptoms before and after treatment with atomoxetine. PA, participant. Star: participant 5 (PA-5) withdrew at week 8 (of 10) because of persistent headaches. Change in anxiety symptoms before and after treatment with atomoxetine. PA: Participant. Star: participant 5 (PA-5) withdrew at week 8 (of 10) because of persistent headaches. A qualitative, nonexhaustive review of literature suggests a high prevalence of ADHD in incarcerated adolescents with significant comorbidities, such as conduct disorders and SUDs. Psychostimulants are effective in the treatment of core symptoms of ADHD, but their use is restricted in correctional settings because of the high prevalence of comorbid substance use disorders and concerns about abuse, misuse, and diversion. The use of α2-adrenoreceptor agonists is also limited by concerns about cardiovascular side effects. Atomoxetine, a selective NET inhibitor, provides an important alternative for the treatment of adolescent ADHD with comorbid SUD in the correctional setting. The case series conducted in the CDOC suggests that atomoxetine would be effective for the treatment of adolescent ADHD in inmates. Atomoxetine was effective for ADHD symptoms in the context of significant past substance misuse. Atomoxetine also treated comorbid anxiety symptomatology in the participants. It showed a favorable safety and tolerability profile. Limitations of this case series include the small sample size, open-label status, and uncontrolled design. This pilot case series is a step toward larger, controlled studies to investigate the effectiveness of atomoxetine for the treatment of adolescent ADHD in correctional settings. The authors thank the Connecticut Department of Correction (CDOC) for their support and the CDOC facility custody staff and Correctional Managed Health Care staff who made the implementation of this project possible. Disclosure: The case series described in the article was supported by an investigator-initiated grant from Eli Lilly and Company, Indianapolis, IN.